In Canada, approximately 60 distinct indigenous languages are spoken. According to the 2006 Census, 18% of all First Nations children and youth 2 to 24 years old had an Aboriginal mother tongue. This was markedly more prevalent among Status children and youth living on-reserve. On-reserve, 38% of Status First Nations youth ages 15 through 24 years spoke an Aboriginal mother tongue, as did 34% of those ages 6 to 14 years and 36% of young children ages 2 to 5 years. Once off-reserve, speaking with an Aboriginal mother tongue was reported by only 9% of Status youth ages 15 to 24 years, 5% of children ages 6 to 14 years and 6% of children ages 2 to 5 years. 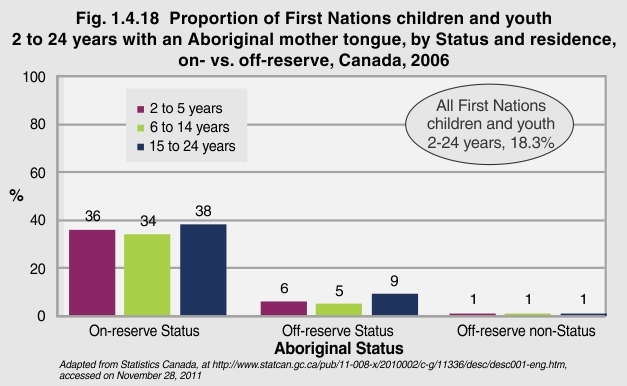 Off-reserve non-Status First Nations children and youth were least likely to speak an Aboriginal mother tongue, with only 1% of the under 25 population in each age group reporting doing so. “Language is our unique relationship to the Creator, our attitudes, beliefs, values and fundamental notions of what is truth. Our Languages are the cornerstone of who we are as a People. Without our Languages our cultures cannot survive”. “The threat of their languages disappearing means that Aboriginal people’s distinctive world view, the wisdom of their ancestors and their ways of being human could vanish as well”.